John Russo, chaplain of Evanston American Legion Post 42, salutes during the presentation of colors at the Veterans Day ceremony held in Fountain Square on Monday morning. U.S. Rep. Jan Schakowsky (D-Ill.) and Mayor Elizabeth Tisdahl were both present at the event. Veterans and residents braved the rain Monday morning to mark Veterans Day in downtown Evanston. “We want to dedicate this day and honor our brave veterans who served their country,” said Charles Spivey, who was a U.S. Air Force commander in the Vietnam War. Despite the forecast of snow, more than 150 people gathered in Fountain Square wearing heavy coats and carrying umbrellas. Elected officials and veterans spoke about the importance of the holiday and showing appreciation to veterans. “The best way to give thanks to those who served our country is to make sure we provide them and their families with the help they deserve,” U.S. Rep. Jan Schakowsky (D-Evanston) said. Greg Lisinski, commander of American Legion Post 42, led the ceremony for the fifth year. He took over duties from celebrated Evanston figurehead Allen “Bo” Price, who died in May 2009. Price ran the ceremony for 40 years, so Lisinski said he was “honored” to follow Price and continue to portray Veterans Day as a cherished holiday. Children from an Evanston Girl Scouts troop and the Fleetwood-Jourdain Community Center also attended the event. Rickover Naval Academy High School students presented the American flag and a gun salute. In an old tradition, everybody faced east during the moment of silence. Veterans saluted, many donning baseball hats and garrison caps that displayed their awards and wars in which they fought. Four wreaths were placed by the base of the American flag at the conclusion of the ceremony. One of the oldest veterans present was 86-year-old Lloyd Idelman. Drafted out of high school, he served as a member of the Vienna military police during World War II. He has attended the Evanston ceremony with his two daughters since they were children. One of them, Marilyn, includes her twin children in the tradition and has been bringing them since they were 2 years old. “I want them to be aware of the sacrifice that veterans made for their country, especially their grandfather,” Marilyn Idelman Soglin said. 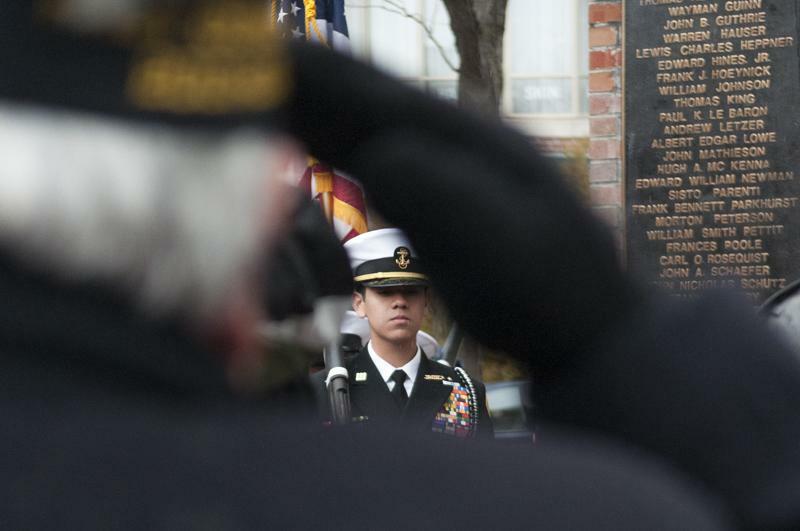 Northwestern held its own Veterans Day ceremony Nov. 6, hosted by NU’s Naval Reserve Officers Training Corps program. NROTC members laid a wreath on a memorial rock near University Library, where it will stay for a week.